Jessica L Reynolds, MD, Joerg Zehetner, MD, Nikolai Bildzukewicz, MD, Namir Katkhouda, MD, Elizabeth Hong, Jonathan C Cash, MD, John C Lipham, MD. Keck Medical Center of the University of Southern California, Los Angeles, CA. Introduction: The traditionally high recurrence rate after laparoscopic repair of intrathoracic stomach has been reduced by use of mesh to reinforce the crural repair. We previously described a simplified technique for crural reinforcement using Vicryl mesh and Bioglue, with an acceptable recurrence rate at 1 year compared to other studies using mesh secured with sutures or tacks. The aim of this study is to assess outcomes in a larger series with long-term follow-up and determine the rate of recurrence. Methods: The charts of all patients who underwent this repair from June 2006 to June 2013 using the previously described technique were retrospectively reviewed. Intrathoracic stomach was defined as >50% of the stomach herniated into the chest. Follow-up assessment was routinely performed at 1 year intervals, including endoscopy, video esophagram, and GERD-health-related-quality-of-life (HRQL) questionnaire. Recurrence was defined as any identifiable hiatal hernia on either EGD or VEG. Results: A total of 145 patients (m/f=39/106), with a median age of 69 years (36-93 years), underwent repair with a mean follow-up of 24m (0-73). Follow-up for patients 2 years or more after surgery was available for 75/78 eligible patients (96% follow-up).The mean operating time was 134 minutes (60-311 minutes) and mean hospital stay was 2 days (1-21 days). There were 6 conversions (4.1%) and 2 intraoperative complication (1.4%) which were an esophageal perforation from placement of the bougie and a tear of the splenic capsule. Sixteen patients (11%) had postoperative complications including one reoperation for persistent pain and dysphagia 17 months postoperatively. This patient was found to have an abscess at the hiatus containing Bioglue. Another patient developed esophageal rupture after inducing vomiting on POD #10. There was one 30-day mortality in a patient who died from sepsis secondary to a perforated diverticulum on POD#10. 98/112 patients at least 12 months post-surgery (87.5%) had either an EGD or VEG. Recurrence was detected in thirteen patients (13.2%) with a median time to recurrence of 26.3 months (10-67m). 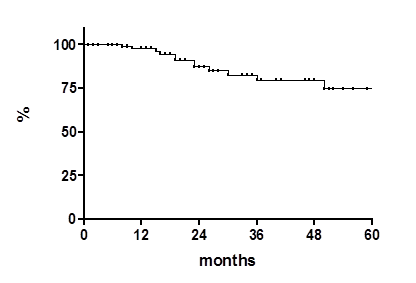 Recurrence rate over time was 2.3%, 12.7%, 20.3%, 20.3% and 25.3% at 12, 24, 36, 48 and 60 months, respectively. (see Kaplan-Meier recurrence-free curve below). 7/13 were defined as “small” (<2cm), 5/13 as “moderate” (2-4 cm) and 1 as “large” (>4cm). The mean GERD-HRQL was 3.8 in patients without recurrence (0-28) and 4.5 in patients with recurrence (0-15). The vast majority of patients (95%) were satisfied with the operation. Conclusion: Laparoscopic intrathoracic stomach repair with crural reinforcement using Vicryl mesh and Bioglue proves to be effective, safe and durable, with excellent symptomatic results, and a high degree of patient satisfaction. The rate of recurrence tends to plateau over time with the majority of recurrences being small-moderate and asymptomatic.